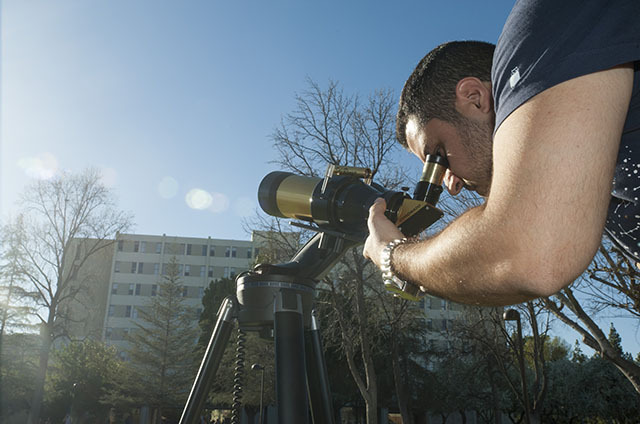 CSUN physics graduate student Menoa Yousefi observes the sun through a portable solar telescope. Photo by Ruth Saravia. California State University, Northridge holds this year’s record for the largest increase in research publications rates in North America, according to a listing of top tier peer-reviewed journals selected by the journal Nature. The list, created by Nature Index, is made by analyzing research institutions in North America and their research output percentages from 2012 to 2015. Articles in chemistry, life sciences, physical sciences, and earth and environmental sciences published in journals chosen by Nature were the markers. CSUN Dean of the College of Science and Mathematics Jerry Stinner said being listed among the top 25 Rising Stars is a great honor for the university. CSUN held the highest percent increase in publication rate at more than 190 percent, followed by National Aeronautics and Space Administration (NASA), the U. S. Geological Survey, Carnegie Mellon University and Stanford University. CSUN is the only public institution of higher education in California listed. The college includes the Departments of Biology, Chemistry and Biochemistry, Geological Sciences, Mathematics, and Physics and Astronomy. Stinner noted that research by faculty in all of the departments contributed to the listing. 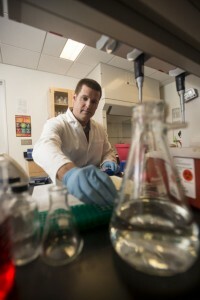 CSUN biology professor Jonathan Kelber makes cancer cell samples to analyze in his lab. Photo by Lee Choo. Fellow cancer researcher Jonathan Kelber, a CSUN assistant professor of biology, added that the listing is a major bonus for the university because of Nature’s high profile. CSUN anthropology professor Hélène Rougier’s recent article on the origins of Eastern European Neandertals received the university’s highest score in outreach, called an altemetric score, according to Nature Index. Rougier, whose department is in the College of Social and Behavioral Sciences, expressed gratitude for the listing and said the work of CSUN’s researchers speaks for itself. 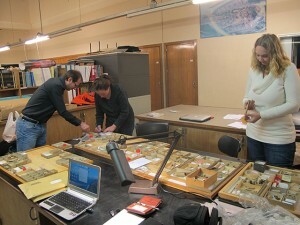 CSUN anthropology professor Hélène Rougier (center) identifies human skeletal remains among the collections from the Goyet cave in Belgium with colleagues from her project team, paleoanthropologist Dr. Isabelle Crevecoeur from Bordeaux University (right) and archeozoologist Cédric Beauval from Archéosphère in France (left). Photo provided by Hèléne Rougier. Kelber noted that Stinner provided him with exceptional support when coming to the university, which led the professor and his team of students to find causes of certain forms of cancer in their research, he said. CSUN’s place on the Nature list is also thanks to support from CSUN’s leaders, including Stinner and biology department chair Larry Allen, Oppenheimer added. Allen reiterated that the work of the college for the past decade toward supporting its faculty has contributed to having CSUN on the listing.